This painting shows the lock, leading to the artificial channel on the left, with the high level bridge over the channel seen in the distance. The original channel of the Rideau River is below the embankment on the right. About this Painting: This painting is part of a series of 23 watercolours showing all the lockstations. There are at least 4 different copies of each painting (done before the days of copiers, each one had to be painted individually). These unsigned watercolours are credited to either John Burrows or to William T. Clegg. 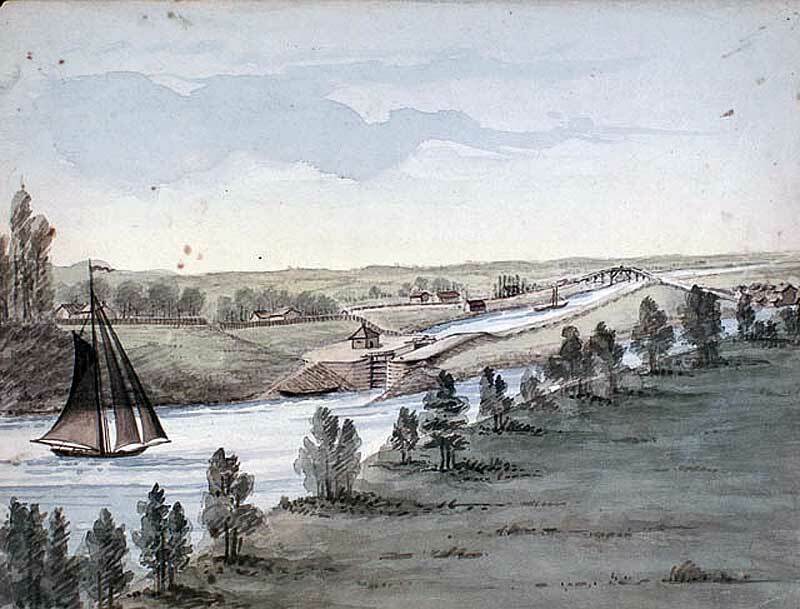 Burrows was an Overseer of Works of the Rideau Canal from 1827 to 1848. Clegg was the Paymaster for the Rideau Canal (Clerk of Cheque) from 1827 to 1845. It is speculated that this series of watercolours may have been prepared to document the Rideau Canal for presentation to visiting officials. I think it most likely that John Burrows was the main artist, he was a surveyor and trained in art. But Clegg may have annotated the paintings, and perhaps had a hand in making copies of the originals. The paintings are undated, but features in some of the paintings (such as lockmaster houses) suggest the early 1840s.